Describe ways in which color and texture can work in harmony to create innovative kitchen and bath spaces for a variety of residential projects. Discuss the range of design strategies, products, and materials used in the featured projects from functional and aesthetic perspectives. Explain how high-quality products, including specified appliances, can contribute to better kitchen and bathroom designs that meet current trends. Describe how kitchen and bath design can creative a cohesive space while embracing the individual lifestyle needs and preferences of family members. 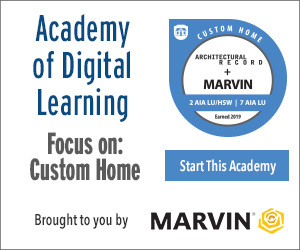 This course will examine nearly a dozen custom home projects featured in Architectural Record with a focus on standout kitchen and bath designs from around the world. These innovative projects feature a variety of approaches for creating functional and beautiful spaces through the strategic use of such elements as color, texture, and modern fixtures. A shopkeeper's London apartment is designed to be extremely versatile with "no names for rooms." A cedar shingle-clad vacation home offers expansive ocean views to a couple from the West Coast.